This is a branch of a thread-within-a-thread from the MultiPhase Project thread. Concerning the Klee Sequencer, which is a shift register based random pattern generator. In this second sample, I used only three pots to set the voltage values. All of the sequences are in the 'random' mode. The voltage input was being fed by an LFO. It's multi-tracked. The only controller used in the sample was the Klee. The sample is 5.08 MB. I'm attaching a schematic to the Klee. 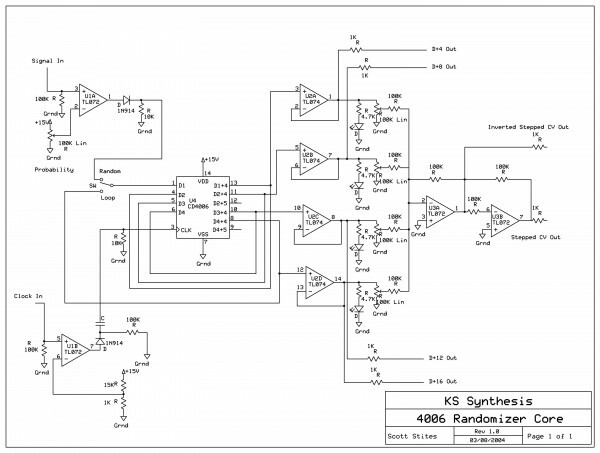 These days, I'd work things a bit differently - instead of the TL072, I would go more for the comparator circuit that Ken Stone uses in his gated comparator, and I'd put some hysterisis in there, I think. There may be a few things I fiddled with that didn't make it to the schematic - I recall there being an LED to indicate when the input was a 1 or a 0 from the voltage input comparator. I think I had some gate to trigger converters on the gate outputs. Ah, yes, I believe I inverted the clock input to track with the 4006 when using the clock as the trigger source for EGs, etc. The reason being that the CD4006 clocks on the falling edge of the input clock. Sadly, the 4006 is no longer in production, and may be a bit hard to find. A couple of CD4015's would work in this app. Note that there are some 'odd' numbered outputs I didn't use on the 4006 - these can be utilized as well, but the timing for them can get a bit weird (which is not necessarily a bad thing). That second MP3 was a project of considerably less effort than the first MP3. A thought that I've had for a while, just to expand the usability of the Klee would be to add a data distribution IC between the 4006 and the buffers. I've got some CD4019's, for example, that would work. The CD4019 can choose between two inputs and output the data from the selected input. It's not really a switch IC, but just logically chooses between the two data inputs. Anyway, if one put in a regular four bit counter, one could select between a pattern generated by the 4006 or a straight binary count from the counter. In this case, the Klee would put out 'standard' stairstep voltages, with intervals as determined by the pots. As with the Klee, it could be also used as a source for gates, but with predictable results (just /2, /4, /8 and /16 divisions of the clock itself). You could even rig it to switch from the 'counter' mode to the '4006' mode on the fly to mix things up. A note about the gates here: the 'D+X' outputs are intended here as gate outputs. You'll notice that these will be whopping big ~+15V gates unless the voltage is reduced. From the ground up, I've designed my synth to be able to handle these levels as well as the more accepted standard levels, but if you build this, and your synth isn't designed to handle these levels, obviously they're going to have to be chopped down to what you normally use. Also, nowadays I might AND the gate outputs with the input clock...or not, guess I'd want to play with that. Remember, the Klee will advance on the falling edge of the input clock. As I did on the breadboard, but didn't put in the schematic (yet) it will make things easier if you invert the clock in. A further use for this core - drive a 'normal' 16 step sequencer with the data outputs. If you put in the data selector as mentioned above, the counter selection would act as a, well, sequential sequencer (with u/d selection if you used a CD4516 as the counter chip). Flipping it over to the 4006 data, the sequencer would then be random pattern, or a looped 16 bit random pattern, depending on what mode the Klee circuitry is in. I added an inverted feedback option, which makes it come more alive I think. Cool! I don't have the G2 demo on this ancient home puter of mine. What is the inverted feedback you added? Are you inverting the feedback in the loop mode or is it something else? Are you inverting the feedback in the loop mode or is it something else? Ah, interesting! I'll have to try that next time I BB it. I think another trick, to really mix it up, would be to EXOR it with another one of the bits in the register, maybe one of the 'odd' outputs I didn't use. wow, 1st mp3 sounds awesome! I put a description of the recording in the MultiPhase thread a little while back. The idea for the circuit kinda hit me when I was playing with the quantized random function portion of the Buchla 266. The idea of putting the comparator on the front end came from Ken Stone's Gated Comparator circuit. Hmmm... I notice Hosfelt lists the CD4006 for a good price (I'd doublecheck and call to make sure they had them). Did somebody designed a PCB from the circuit in the first post?